I’m not a student of Swedish (just curious how to pronounce these vowels), but ö is like the vowel in “bird” or “fur” in varieties of English in and around London, right? in most North American varieties of English (along with Irish English and northern varieties of British English), that vowel is r-colored (pronounced with the tongue curled up toward, but not touching, the palate). Otherwise, very nice explanations. Thanks! You’re talking about the rhotic “r” that is absent from most accents in England, right? Central Lancashire, the South West of England, and parts of East Anglia all pronounce the rhotic “r” as Americans do, but the rest of England doesn’t seem to. To me, the letter Ö sounds the same as the “oeu” in the French word “oeuf”. My family used to spell their name “Petersön” how would that be pronounced? Or, is there a way to spell it that would actually use some type of character and have a legitimate pronunciation? Also, is the Name Richard at all spelled differently or can it be spelled differently to fit a Swedes language? Equally common (and more correct 😉 is the spelling Rikard. When I, some years ago, visited USA, I found that nobody I met was able to come close to pronouncing my name the way I say it. After a few days, I started to introduce myself as “Richard” (English pronunciation) instead to make it easier for the people I met. I’ve recently began taking a course in Swedish. Although I do find some of the grammar confusing (ie. 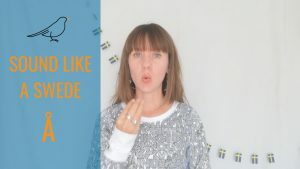 when to use “du”, “ni”, or “ni är”), easily one of the most frustrating things for me was the pronunciation. It seemed like sometimes, the ‘å’ sound would make an ‘o’ sound, sometimes an ‘a’ sound, an ‘oa’ sound, and sometimes an ‘au’ sound (as in “Paul”). Sometimes a regular ‘s’ sound would be said as ‘sh’, as in “varsågod”. An extra j/y sound would be made in words like ‘flicka’ (making it sound like ‘flickja’). The ‘ö’ sound made an ‘e’ sound in words like ‘mjölk’. The ‘g’ was silent in ‘Jag’. “De” was pronounced as “Dom”. Overall, I have just been very confused with the pronunciation. If anyone can clarify or explain these odd pronunciations, it would be greatly appreciated. SIDENOTE: Is there a consistent way to differentiate as to when you should use “en” or “ett”? I’m glad to hear other languages have unknown strangeness like English. In my native Western US dialect (Wisconsin too) we commonly say ‘you betcha’ in place of ‘your welcome’. A Filipino friend of mine asked me the why we say that or what does it mean. I had never thought of it before and I still have no idea why we say that. It doesn’t even make sense. “You betcha” is probably a shortened version of “You (can safely) bet (that) you’re (welcome)” –with the words in parentheses being the ones now omitted, & the remaining ones slurred together. Thanks for the useful explanations. I was just curious. I recently ran across the Swedish name “Måårdh.” I understand how to pronounce the single “å” but what happens when you double it? What English sound would that rhyme with? Fly, ugly fly, fly, and the ugly fly flew. It’s rather hard to turn into English, so I understand your mistake was easy to make. However, please be more precise next time. Hi, have you come across the name Idäna for a female in Sweden? I’m looking for nice short word in the Swedish language with letter O & two dots above ,meaning : good , central, excellent, harmony & so one , any Idea ? Stort tack for denna sida. Jag arbetar utomlands och min a utlandska kollegor har uppskattat den! Dessutom saknar min jobbdator svenska och nar jag har behovt skriva kortare texter med svenska vokaler har jag anvant copy-paste fran er sida (inte speciellt effektiv metod, men mycket uppskattad I brist pa annat!). Tydligen är det förenklat. “Ä” har två sätt att uttalas. While your explanation of å,ö,ä are helpful, I don’t think you’ve covered the entire pronunciation problem. ”Ä” really has two – at least – pronunciations according to it’s environment. For instance, “jag är” can often be prononceras without its ”r” sound all together. Also, it can have the sound of long ”a” in English as in ”bay”, and there is a second pronunciation: ”eh” as in the English ”bet”. I’ve found no logical explanation of this this change which must be governed by the environment of the sentence. Double consonants following vowels can change their sound altogether. Is this a part of this sound change? If so, please explain which environment controls each pronunciation change. 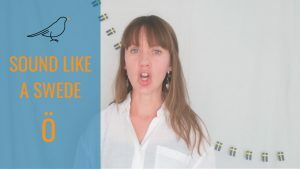 Hi, I am trying to learn Swedish on my own time but i am having a difficult time learning all of these vowels because I only know the States English and learning a new language really does not come easily to me unlike other people would so if you could please help me out that would be really appreciate!! And I barely know any Swedish so yeah. If you want to get back in touch just let me know. Hej Cody! You are welcome to book in a lesson with us, if you want one-2-one feedback on your pronunciation and help to develop your spoken Swedish. Have you checked out all the other vowel-videos on our Youtube channel? I have started to learn Swedish about few months ago, I have to say on the paper, it is sooo easy! Like an easy English and German! Because I used to learn these tongues! However, I should add two things, one thing, speaking and articulation is so hard! AND the sound of language is not pleasant for a Persian speakers! Apart from this I guess it is like Esperanto! Even easier, I was improving in just 24 hours! I didn’t reach to these åäö yet! 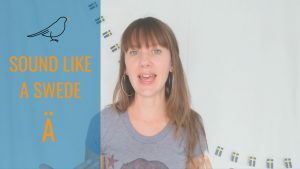 Danish, Norwegian, Swedish are so similar in sound! Hi, would the swedish word for birch (bjork) have the dots over the o? My last name is Bjorklund and I have been asked that question a few times and I’m not sure. I’ve heard both answers from my own family.